The recent passing of our first anniversary gave our Head Distiller Iain Robertson a fine excuse to dip the casks and sample how our spirit is maturing in our island warehouse. 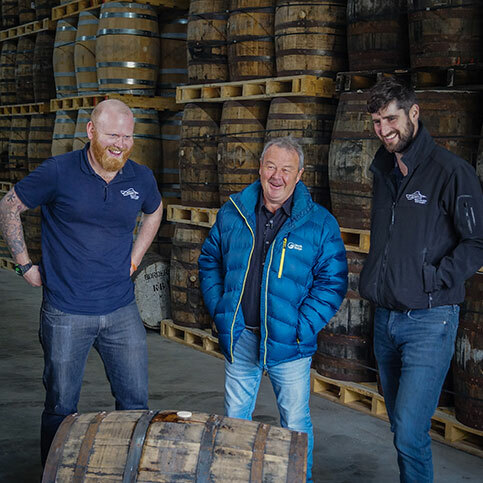 Iain discovered that our three different oak casks; rye whisky, virgin oak and Bordeaux wine are evolving three very different colour and taste profiles as they mature towards our future Isle of Raasay Single Malt. Having received a silver award at this year’s International Spirits Challenge for Raasay While We Wait Third Release, we are looking forward to sampling the latest Raasay While We Wait 2018 Release, our 4th in the While We Wait series. This 2018 Release is already available to pre-order on our website and will be launched on general release on 10th October 2018. 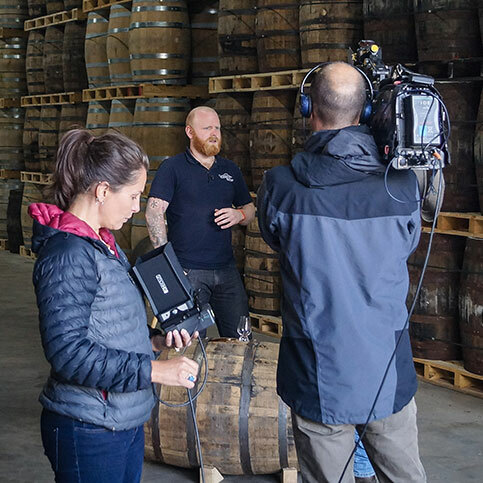 Tune in to BBC Scotland’s Landward at 7.30pm on 5th October to see some familiar faces. Presenter Euan Macilwraith visited the distillery to discover how the barley harvest has progressed this year in Andrew Gillies’s field at Croft No 4. We enjoyed the Landward team’s visit as they also took time to visit Calum’s Road and spend some time chatting with island crofters about livestock and wildlife. 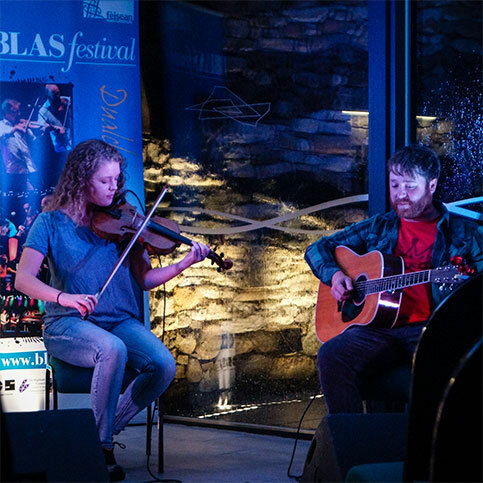 The music keeps coming at the Distillery and another great night was had during the annual Blas Festival with the visit of fine Cape Breton musicians Doug Cameron and Chris Babineau. 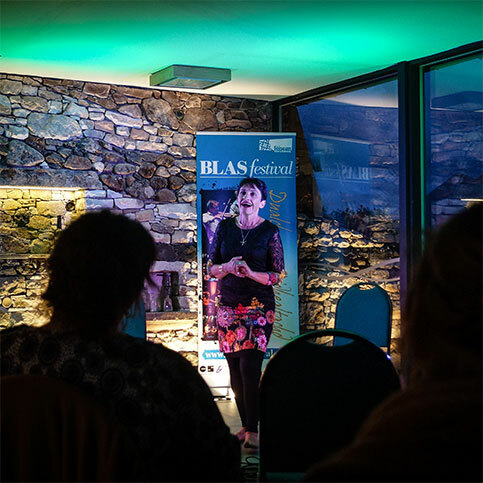 To add some local flavour Skye’s own Anna Mhartainn led the audience in some lively puirt-a beul singing. Then our own Rosie Macleod showed we have some fine talent here at the distillery when Doug Cameron offered her his fiddle across the bar and she gave us some cracking Raasay tunes. Make sure to join us for our next evening of live music on the 2nd November 2018 as Calum Alex MacMillan and Ross Martin join us for two sets starting at 8pm as part of this years Raasay Whisky, Fire & Song event being held on the island on the 2nd & 3rd of November 2018. Keep an eye out for upcoming events at the distillery. Your Slàinte Club welcome email includes details on how to take advantage of your exclusive benefits, including a discount code to enjoy unlimited free UK delivery on online orders over £30.